The journey to Lincoln from High Wycombe is a bit of a cross-country affair. A reasonably safe route, in terms of avoiding potential traffic congestion, is to travel east on the M40 and then cut across to join the M1 northbound via the A43. Leave the M1 at junction 21A and continue on the A46 (signposted Leicester and Newark). After approx 48 miles on the A46 join the A1434 (s/p Lincoln South). Following 'Lincoln and City Centre' signs for about 4 miles then get into inside lane (s/p City Centre, Worksop A57) and go straight on at roundabout into the High Street. After 0.5 miles get in outside lane, and go straight on at lights (s/p City Centre, Worksop A57). Turn right after around 200 yards into Scorer Street. Sincil Bank is first turning on the right. Check www.rac.co.uk for specific or more detailed directions. Train: Lincoln Central is the nearest station and approx 15 minutes walk to the ground. Connections from High Wycombe can be made via London Marylebone, London Kings Cross and to Lincoln via Newark North Gate, Peterborough or Doncaster. Approx. journey time is between 3.5 and 4.5 hours. Check www.nationrail.co.uk for specific times and connections of trains. Guy Branston - Defender who spent a short loan spell at Lincoln during the 1999/2000 season from Leicester City where he had started out as a trainee. Subsequently went on to join Rotherham from where he had a two month loan to Wycombe during the early part of the 2003/4 season. Loaned to Peterborough United later that season before moving on a free to Sheffield Wednesday. Moved to Oldham Athletic in February 2005. His time at Leicester also saw loans spells with Rushden, Colchester and Plymouth. Graham Bressington - Tough midfielder who originally moved to Lincoln City from Wycombe during the 1987/88 season having revatilised his football career at Loakes Park following his release from West Ham. Born in the High Wycombe area and played for the local schools side in the early 1980's. Made 62 appearances for Wycombe, scoring five times. Moved to Southend United from Lincoln in 1993. Matt Carmichael - Played for Wycombe in the Conference in the late 1980's before a surprise move into League football with Lincoln City via Basingstoke Town in August 1989. Made 133 League apps for The Imps are scored 18 times before a move to Scunthorpe United in the summer of 1993. Also had short spells with Preston, Mansfield, Doncaster and Darlington before moving back into non-League football with Ilkeston Town. John Cornforth - Joined Wycombe from Birmingham during the 1996/97 campaign but left in May 1999 after failing to regain the form that gave him Welsh International honours during a five year spell with Swansea City. 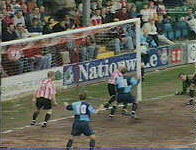 Was briefly at Scunthorpe in 1999/2000 before moving to Exeter City in February 2000. Originally started his career with Sunderland where he made nine Fourth Division appearances while on loan at Lincoln City during the 1989/90 season. Has also played on loan at Doncaster, Shrewsbury and Peterborough. Tony Cunnigham - Played for 11 Football League club's, starting his career with Lincoln City in 1979 and ending his career with Wycombe in the 1993/94 season. Featured in the Imps promotion winning side of 1980/81 and scored 32 times in 123 League apps before an �80,000 moved to Barnsley in 1981. Went on to play for Sheffield Wednesday, Man City, Newcastle United, Blackpool, Bury, Bolton, Rotherham and Doncaster. Made just five appearances for Wycombe before moving into non-League football with Gainsborough Trinity. Mark Foran - Defender who had a short loan spell from Sheffield United at Wycombe 1995 under Alan Smith. The former Millwall trainee moved to Peterborough United in February 1996 for a �30,000 fee and made two loan appearances for Lincoln from Posh during 1996/97. Also spent time on loan to Oldham before joining Crewe in December 1997 for �45,000. Transfered to Bristol Rovers in the summer of 2000 for �75,000 and made 54 appearances during a two year spell. Moved to Telford United and then Northwich Victoria in the latter part of his career. Stefan Oakes - Joined The Imps in the summer of 2008 following a three year with Wycombe where he totalled 124 appearances and scored 9 goals. A former Leicester City trainee who has also played for Crewe, Walsall and Notts County. Mark Stallard - Former Bradford City striker who scored 25 goals in 78 appearances for Wycombe aftr a �100,000 move from Valley Parade in March 1997. Moved to Notts County in March 1999 for a fraction of that fee and went on to enjoy a five year spell at Meadow Lane. Spent time at Barnsley and loan spells with Chesterfield, and back at Notts County before a free transfer to Shrewsbury in the summer of 2005. Joined the Imps in the summer of 2006 and scored 17 League goals in 66 appearances before signing for Mansfield Town at the start of the 2007/8 season. Also - James McCormick - Lincoln City outside right of the late 1940's was Wycombe Wanderers first full-time coach in the 1951/52 season. He also played for Fulham and Chesterfield. Ron Smillie - Father of former Wycombe Manager Neil Smillie made 91 League appearances and scored 15 times for Lincoln between 1956 and 1959.